I am home from my long weekend at The Collins Group rep show. This is a show Hero Arts goes to every year where we get to teach store owners. And I love it. Seeing the same sweet faces year after year… chatting with my favorite stores (including Absolutely Everything, Buffalo Stamps, Angela’s Happy Stampers, Wiggles and Giggles and many more)… laughing with fellow industry folks… I love it all. Shari, Todd (Hero VP) and I had so many really good laughs. REALLY heart-warming good laughs and I am so thankful for them. The winner of the My Favorite Things die/stamp set is Angel. The winner of the Tim Holtz goodies is Barbara G.
The winner of the Hero Arts and Basic Grey giveaway is Cindy Stewart. I will be back soon with a card share. Off to play with the little guy – he is on spring break this week. Take care! Thanks for sharing. Enjoy the time with your little guy. Love those hoops! Will you do a tutorial or another in-depth post about them, please? Looks like you had a blast in that class! And, I would love to see a tutorial on the hoops sometime, too! Congrats to the winners! Enjoy your goodies! I really like the make and takes and projects from the show. Can’t wait to see the card you’re going to show this time…always a treat! Lucky you Spring Break already!!!!! My break isn’t until April 16th!!!! Seems a million years away…..but lucky & crazy me I”m going to Paris with 35 students…….not exactly a vacation, but it will be a blast. I love watching their faces when the see the Eiffel Tower for the first time. Some of them actually scream and squeal 🙂 & they are 17 & 18 years old! Great idea for the hoops….. hmmm – must see what’s in my stash. Enjoy Spring Break … hopefully the weather is good where you are. So much fun!! Congrats to the winners, enjoy your goodies!! Sounds like a dream job you have! You must have so much fun! Congrats to the winners! Enjoy Spring break. I remember when my guys were young and on Spring Break. We always had so much fun. Looks like a good time was had by all. The other day on the Moxie Fab blog there were some incredible embroidery hoop art. I look forward to you teaching us to make our own. Enjoy your spring break! Love the hoops! Hope to see a little snippet on those! Enjoy your week! Sounds like you had such fun, Jennifer! Enjoy your week with Colin at home! BTW – I have a friend that is working on her very first scraproom & was wondering what type of pens should she invest in? I have Marvey & Tombows just becasue that was available when I started making cards years ago & they work for me. She is more into scrapbooking so I don’t think she really needs to buy Copic markers. Zigs perhaps? 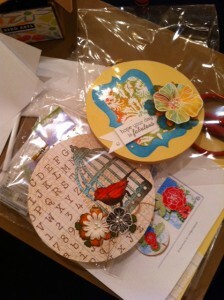 Thank-you for the “hoops” inspiration and your Tim Holtz “frame” inspiration! Regarding the bird cage hoops “background paper”… would you kindly share the mfg. of the paper? It’s absolutely yummy. That is Hero Arts new Designer Papers! big congrats for becoming a go to gal….you will do a fab job. I know that you always inspire me and I love, love the magazines….I am thrilled to have won a 2 yr subscription. My DH giggles when it arrives as I squeal every time. just saw the goto gal announcement and wanted to come over and say congrats! First.. Happy Spring Break! Ours was last week… rained, poured, snowed.. we still had fun! AND Congratulations Go to Girl!!!!!!!! So fun to see you over at the Papercrafts Blog announcement!!!!! Can’t wait to see what my LSS owner learned this year. She always comes back with so much to offer at the store. Hope you have fun spending time with your little guy!